As mentioned earlier, Tauck has a line of river cruises, which you can read more about on our sister site River Cruise Advisor. I learned about Tauck’s ocean cruise product while doing an interview with Senior Vice President of Tauck, Katharine Bonner. After wrapping our river cruise interview, I realized that we would have to sit down again so I could see what Tauck had to offer when it came to small ship ocean cruises. Bonner explains that small ship cruising can mean a number of things to different people. Oftentimes small ships are classified as carrying less than 1,000 people, for Tauck, however, it means less than 300. Yes, that’s right. All of Tauck’s ocean cruises carry less than 300 people per sailing, and sometimes a few as 60. 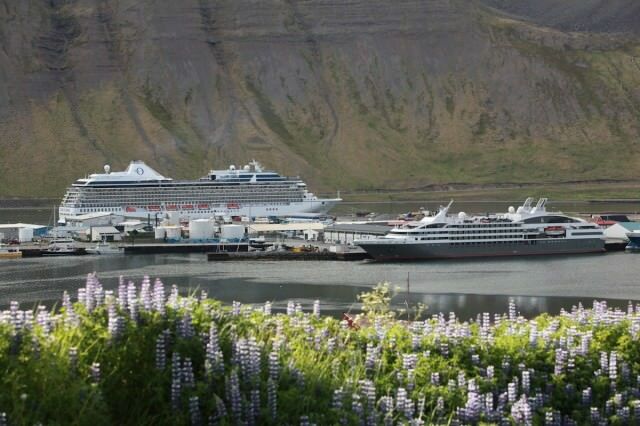 A noticable size difference between Ponant’s Le Boreal and Oceania’s Marina. Now, Tauck doesn’t use its own ships for these sailings; it partners with other cruise companies, mainly Ponant, but Bonner mentioned Windstar as well. Chartering ships through other cruise companies not only allows Tauck to put more focus on its itineraries and tour director training, but also allows the company to feature a more diverse list of itineraries around the world than it would be able to offer with its own fleet. Tauck’s ocean cruise product has grown over the past few years, although not for the reason you may think. Demand for these itineraries has always been high, with some sailings filling up a year in advance. So what caused the company’s growth? Ponant’s introduction of new ships over the past decade. Ponant has introduced ten new vessels to its fleet within the last nine years. This gives Tauck more ships to use, which results in more itineraries visiting more places around the globe. These itineraries range from Antarctic expeditions to cultural journeys in Japan. Dividing cruises into these two categories allows guests to choose an itinerary that will be well suited for them. An expedition cruise is going to be in a more remote area such as Iceland, Antartica, or the Galapagos, and focus on nature; a cultural journey may sail in Europe or Asia, and focus on a more classic cruise experience, putting Tauck’s 90-year experience with tours to use. On every sailing there are multiple Tauck tour directors. As a general rule of thumb, there is one tour director to every 30 to 40 passengers. Tour directors are thoroughly trained, so thoroughly that they take two training trips on the itinerary they are working before guests are ever brought onboard. In addition to the insight of the tour directors, Tauck also has a partnership with BBC. With this partnership, Tauck guests gain access to special videos put together by BBC – and sometimes a BBC expert will even join the sailing. Tauck will offer 29 itineraries in 2020. What is Katharine Bonner most excited for? A new itinerary from Lisbon to London. Ports of call include Bilbao, San Sebastian, Bordeaux, and more. Also new for 2020 is the Mayan Culture & Natural Wonders itinerary that will visit Honduras, Guatemala, and Mexico. With over 90 years of tour experience under its belt, Tauck is sure to provide a memorable vacation, whether on land, river, or sea. Curious to know more about Tauck’s small ship ocean cruises? Check out my podcast interview with Katharine Bonner.